Icy, snowy roads and trails are standard in the winter, so throwing on titanium cleats like the new set from Vargo Outdoors can save you from a nasty spill out on your running route. 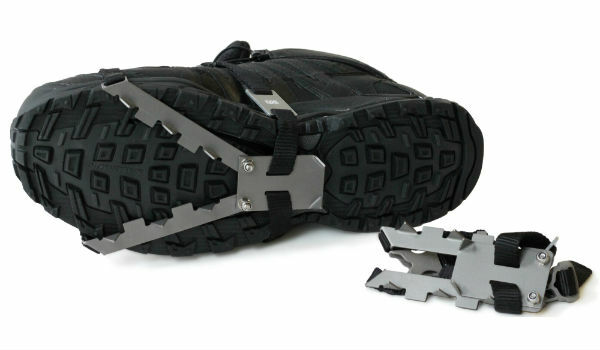 The miniature titanium crampons unfold to fasten to your sneakers or light hikers with toe and mid-foot straps. They weigh under 4 oz per pair for size medium. And they’re easy to adjust. Pre-run, we fit them to our shoes with the cleats at the narrowest part of the shoe’s sole, and the buckles on top of our foot. The cleats’ low profile and claws are similar to what you’d find on the bottom of a snowshoe. When they’re open, they cover your shoe from toe to arch, giving you traction on snow and ice. Folded, they nest small enough to fit into the pocket of your windshell, with the cleats positioned so they won’t rip anything as you run. As great as the cleats are, they aren’t traction devices you’ll want to use in every condition. They’re rigid, so when you transition from ice or snow to pavement or hit a dry patch, you can simply unstrap them, fold them, and stash them in seconds. Vargo’s cleats are available in three sizes.